It's always fun to see a new project get started. 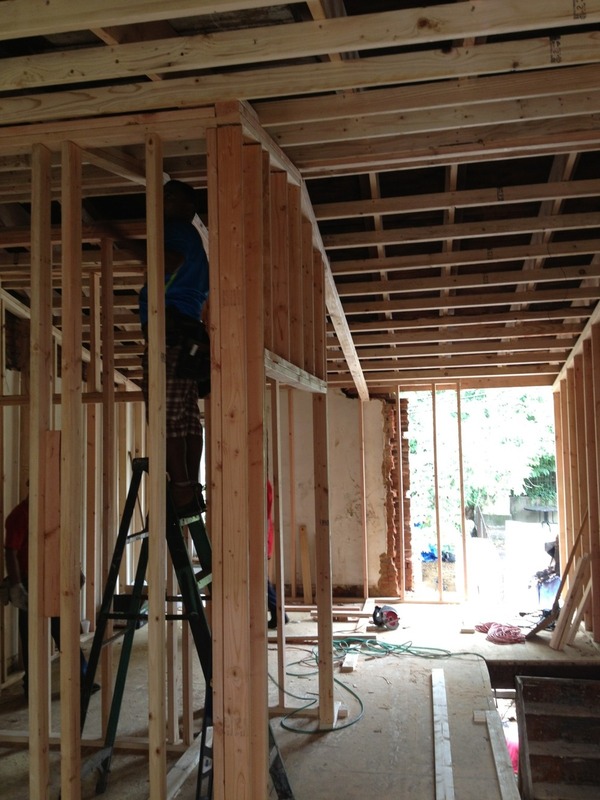 For this one, we'll be rebuilding the rear portion of an existing two-story building and adding a third floor and roof deck. But first--demolition! These brick walls tell a story of many changes over time. Much of the brick will remain exposed. You can see the outline of the former addition imprinted on the neighbor's wall. Metal joist hangers in the former second-floor framing show that this was a modern addition. We'll keep you updated as the project moves forward! Our Tilton Street Residence (constructed by Red Oak Development) is completed and on the market! This is a wide lot (at least, for Philadelphia), which allowed us to turn the stair and make it more sculptural on the main floor. The facade is metal panel, and gives a depth to this mostly-flat surface. There's a balcony at the second-floor bedroom that has a cool view of the elevated highway nearby. 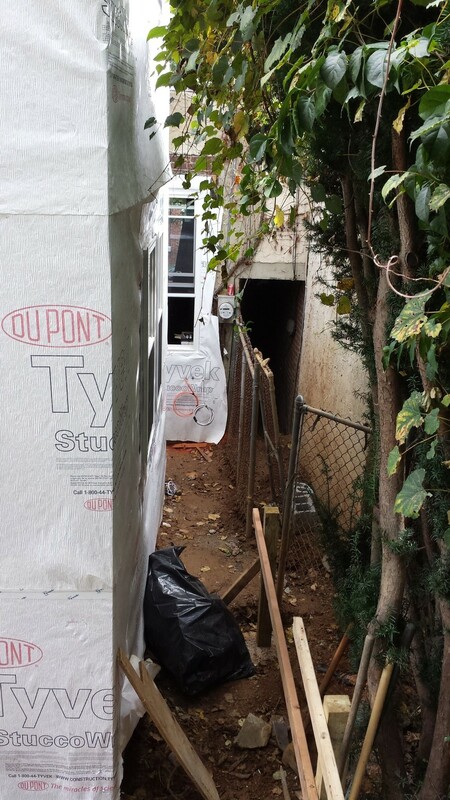 Something we don't talk a lot about with these new-construction houses is the basement. In older houses, the basements are damp, dusty, and have low ceilings (usually around six feet!). However, in new construction you can solve those problems. 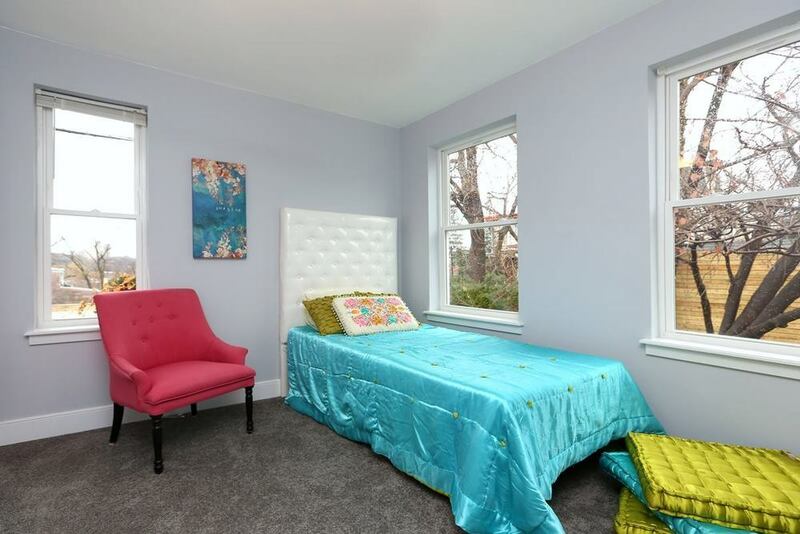 We routinely have eight- or nine-foot basement ceilings, and the waterproofing is dependable enough to install carpeting over the concrete floor. This has the advantage of adding 30% more living space to a three-story house! "Do you do work in New Jersey," you ask? Yes, sometimes we do. We're licensed architects in both PA and NJ, so we've got you covered. Here is a little something we're working on in Voorhees, NJ; an attic conversion. We're adding three dormers (two in the front, one in the back) to the roof of this single-story home, which will add three bedrooms (including a master suite) and some living space. 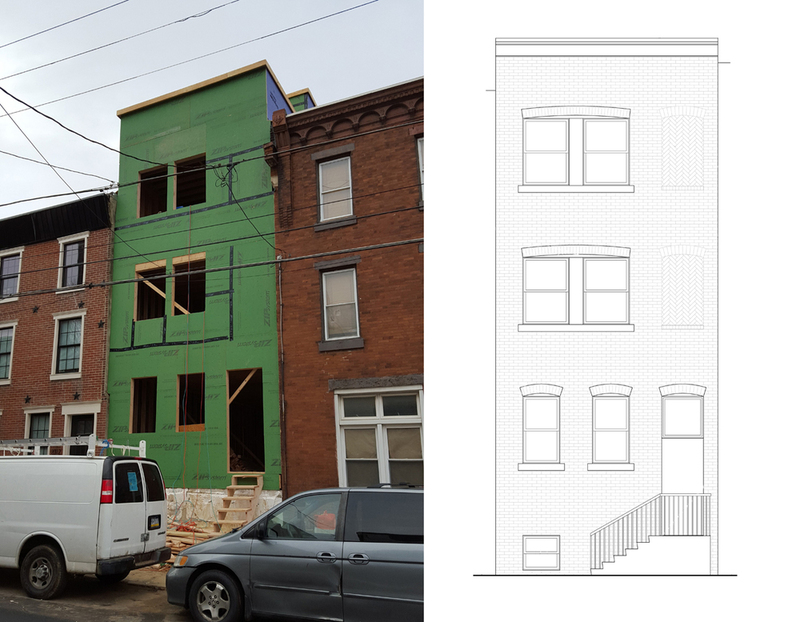 Construction is wrapping up on our new-construction residence on Cumberland Street in East Kensington. 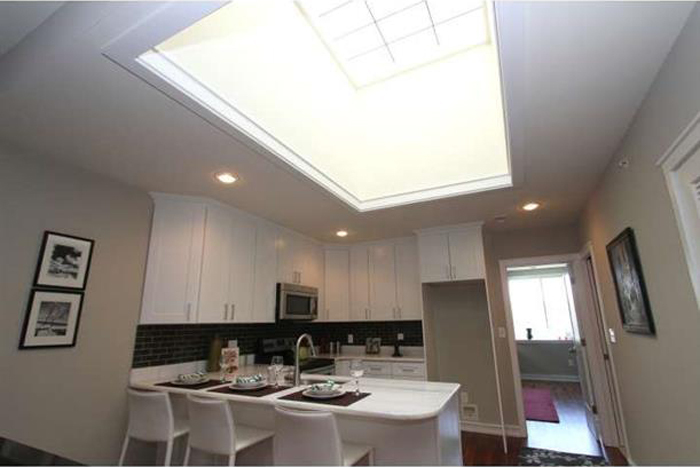 This was a very large (for Philly) lot and we were able to take advantage of the extra space to do a nice, open stair with skylights above, as well as an upper and lower roof deck. The upper deck has skyline views, and the lower deck looks at the rear of our Parish House residences over on Firth Street. 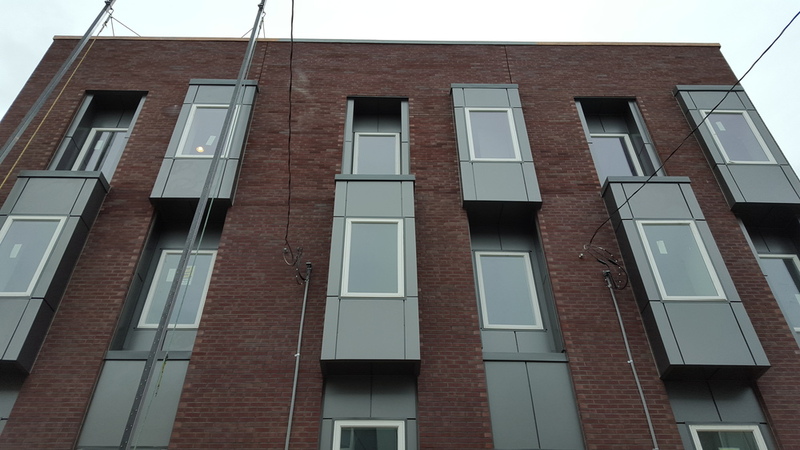 On the facade, we combined red brick and black metal panel, with a bay window that tilts towards a view down the street. Kudos to Red Oak Development on another great project. Construction has just wrapped up on our Coral Street residence. This was a project that started out as a spec house for a developer (Red Oak Development). However, after getting started with construction, a buyer approached the builders, and we worked with her to customize some features of the house, including the master suite and the front elevation. For the front, the buyer wanted something that referenced the existing architecture in East Kensington, where the house is located. This neighborhood is a mix of rowhomes and old factories. For this facade, we used a traditional red brick, with arched windows. On the right, you can see some filled-in openings; this is a nod to the many factory windows that get filled in over time, as the factory's needs change. Back in February, I told you about a project we were working on on North 21st Street (the one that needed Historical Commission approvals--remember?) Well, construction has begun. We had a group meeting with the client, framers, and the plumber on site yesterday, to figure out some strategies for how we'll coordinate everything. These meetings can be crucial, to make sure that everyone knows what needs to happen, and how to avoid making problems for each other. 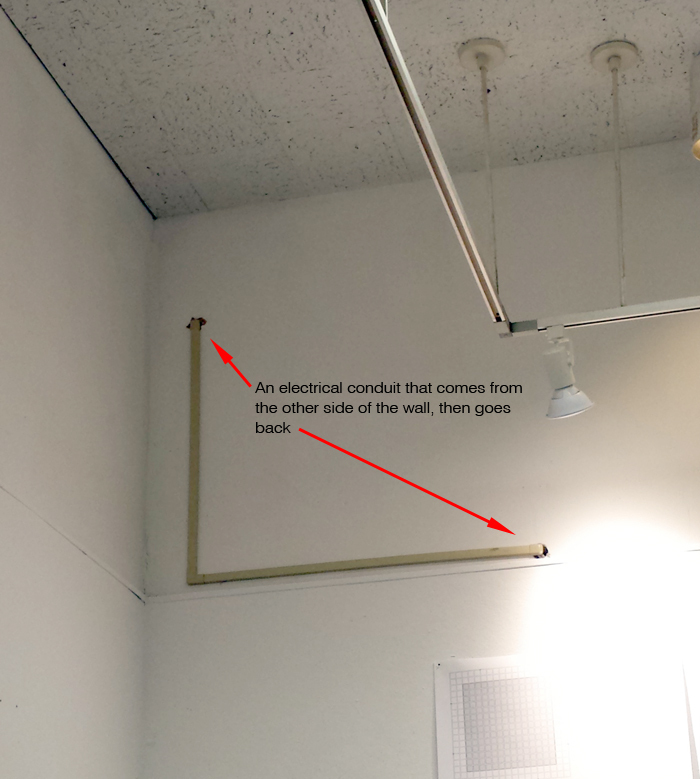 I also got a chance to see how the original builders made an arched recess between two closets. This is a common thing in older homes--two closets on the side wall, with an archway in between where a piece of furniture or shelves might go. This one is all done with wood lath and plaster. Unfortunately, the new design can't accommodate the original arch; instead, we'll be exposing the brick on this wall during the renovation. But it's fun to see how these things were originally achieved. 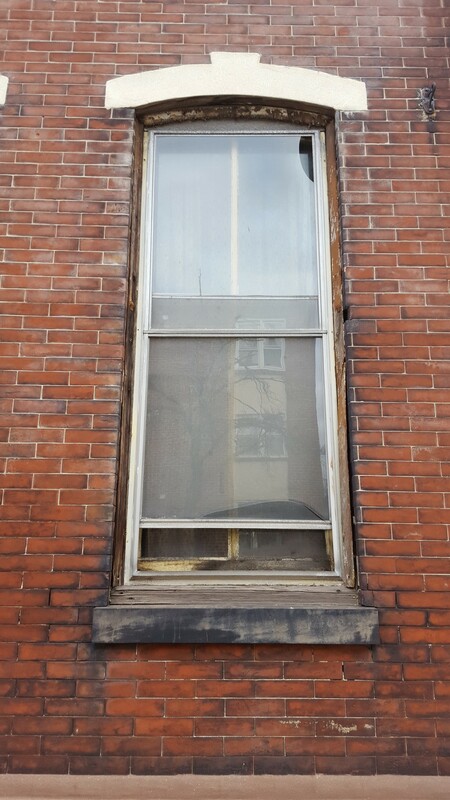 We visited our project site at 2126-34 East Firth Street in Philadelphia yesterday to observe ongoing demolition work. This building was a former Parish House (not coincidentally, our official name for the project) that is being converted into five single-family homes. We're completely redoing the interior, leaving several stone and brick walls exposed. Lots of original detailing, including the main stair that will remain as part of one of the units. We are also doing a third floor addition to gain some extra bedroom space. One of the great things about working with older buildings is the opportunity to be surprised. Demolition has exposed a lot more character to the old masonry walls than we were expecting, so we'll be exposing more than we'd planned. We're also reworking two of the units to take advantage of some material and structural conditions we weren't expecting; they will be amazing. The crew also found a stash of about 100 metal book-printing plates behind a wall (they're in the picture at the top of this post). They are mostly religious in nature, and many of them were wrapped in newspaper, dated 1937. 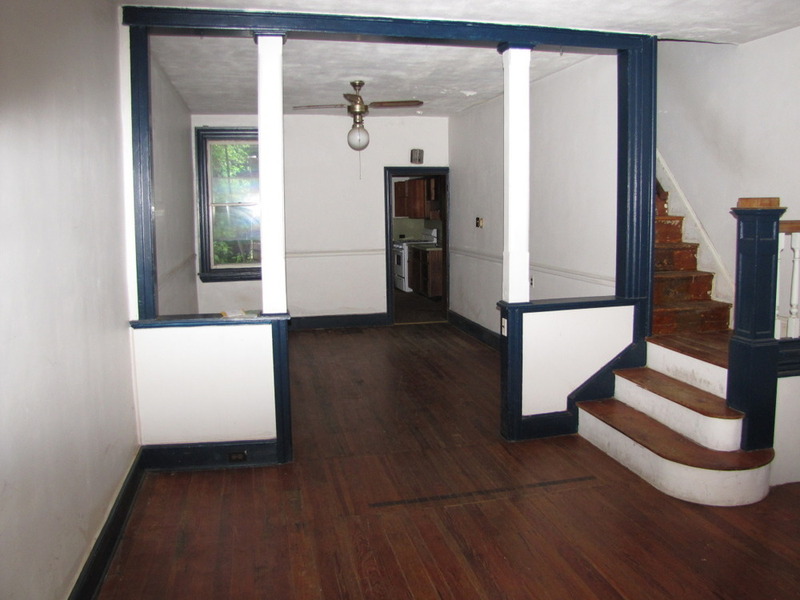 They have also salvaged a lot of lumber, doors, paneling, and several old gas-lighting fixtures. You can see lots of this stuff in the photo below. It's exciting to work with clients--in this case, Red Oak Development--who come to us with great projects, and who also have a vision for the type of work that they want to create. It means that we can take advantage of unique opportunities when they come up, to make the project better than any of us could have expected. Our Arizona Street Residence is nearing completion. This is a sister project to our three Arizona Street Residences that we last wrote about at the end of last year. Those houses were clad in red brick and metal panel. This one is all metal on the front. 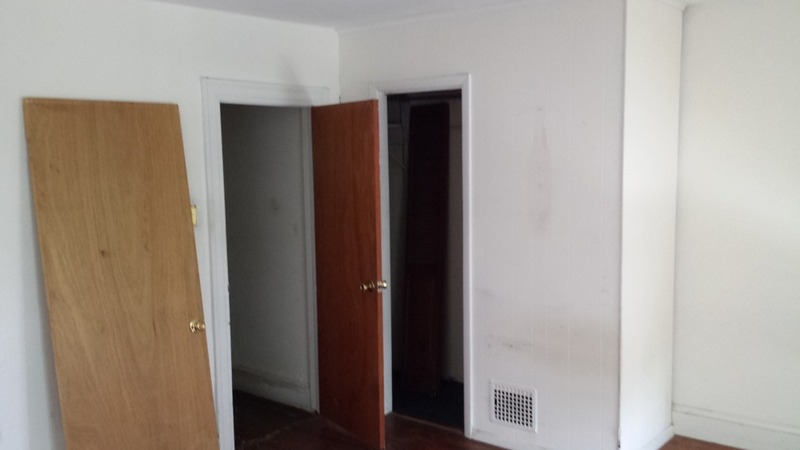 It's a similar layout inside (three bedrooms, 2 1/2 baths, finished basement, roof deck), but this lot is a bit narrower. The narrow lot and low neighbors make this one look particularly tall. Below, some photos from the construction process. framing is finished; you can see the distinct height difference between this one and the neighbors. In the time since these photos were taken, new, similarly-scaled construction has taken place next door. This project sold before construction was completed. Kudos to Red Oak Development on a job well done. Buildings & Water - not very good friends. If you live in an older home, you've probably seen little piles of orangey dust in your basement near the walls. Or maybe you were in an an old house being renovated, and saw something like the picture above. Ever wonder what's going on? 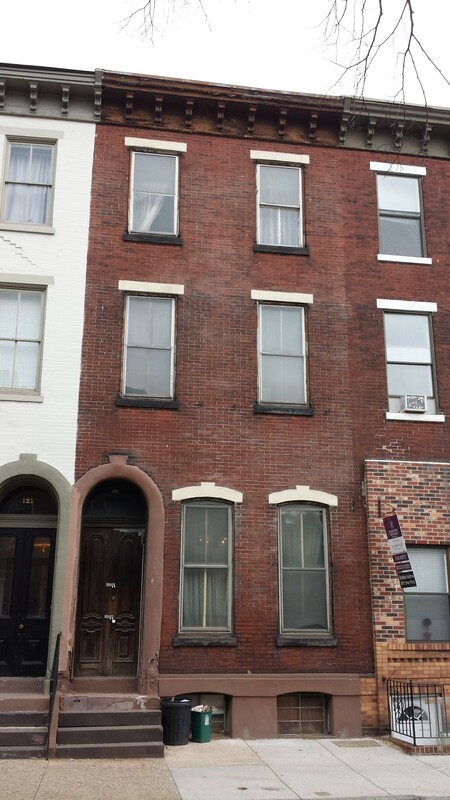 Most older rowhouses in Philadelphia used two main types of brick. The brick you see on the exterior is called "face brick", and the brick on the inside is (often) "salmon brick". When bricks are made, the clay is put into molds or is extruded (like a Play-Doh fun factory) and then gets dried to remove excess moisture. The dried brick is then fired in a kiln to "vitrify" the clay, which is a chemical process that makes the brick hard and water-resistant. This last step is where the second type of brick, "salmon brick" falls short. This brick is fired for less time, so it doesn't have a chance to develop the hard exterior that will protect it from water. It was cheaper to produce than face brick, and was used on the interior of brick walls (most rowhomes in Philadelphia have walls that are two bricks thick--face brick on the outside, and salmon brick on the inside). Water is salmon brick's worst enemy. Buildings have lots of places they can leak--around windows, at roof joints, and at settlement cracks, for example. Once water gets in, it's only a matter of time before the salmon brick starts falling apart, as the water can easily get into its pores. As the brick wets and dries, it starts to turn to powder--the little orange piles you see in your basement. What can you do to fix this? If your brick isn't too deteriorated, then stopping the source of water will mostly stop the damage. Over time you may still see more dust, but the worst is probably over. For a very deteriorated brick, the only solution is to replace it. Make sure you have a skilled mason do this work! In older Philly rowhomes, the bathroom plumbing was often accommodated by notching the floor structure. Here's an example. Not only can you see the deep, ragged notch, but you can also see the water damage where the former bathtub drain leaked water into the wound. This would never pass inspection today. A bathtub was here, so right where you'd want the most strength (400 lbs of water plus the bather) you have a weakened joist. And yet it still stands, 100 years later. How is this possible? Partly, it's because the wood used in older buildings was much denser than wood used today. The wood from back then was taken from natural forests, where trees grew at their own pace. Today, most wood comes from farms, where trees grow on an accelerated schedule (through fertilization and watering techniques), meaning they don't have time to get as dense as they do now. Also, older homes in Philadelphia were often framed with hardwoods (chestnut, for example), while newer wood is softwood, like pine or fir. Hardwood is stiffer than softwood, so it could take more abuse. Regardless, you wouldn't see a notch like this today. If you do, call your architect! Since it's been a couple of weeks since we last posted, there are lots of projects to talk about this time. One thing we've been doing more and more of is zoning plans. Whenever a property owner wants to use a building in a way that isn't normally permitted, they need to get a zoning variance. (I've written about this before: here and here.) Sometimes that's by design, where a client wants to build say, a commercial building on a lot zoned for residential use. Often, though, a property owner will be looking for a variance to "legalize" a preexisting condition on a property they just bought. Last week, I had the pleasure of visiting this beauty in the Cedar Park section of West Philadelphia in order to draw up plans to legalize a four-unit apartment building that is zoned to have only three units. But the fun doesn't just stop with zoning. 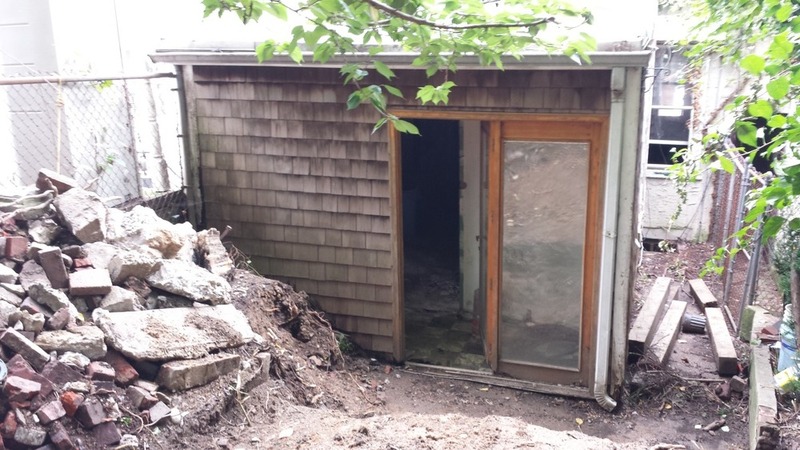 Sometimes you want to do work on a property that's been designated as historic. In that case, anything you do to the exterior needs a sign off from the Historical Commission. We have one project that falls into that category, as well. It's a building near Logan Square that was once a single-family home, but will now be converted to luxury apartments. The windows are original, and we will have them restored to their former glory (and will take down the awful aluminum storm windows that are covering them up!). Once we have all the proper documentation together for the windows, along with the part of the back of the building that needs to be rebuilt, I can take everything to the Commission for their input. Front elevation. This building is part of a whole row that is historically designated. A close-up of one of those giant ground-floor windows--that trim is original! 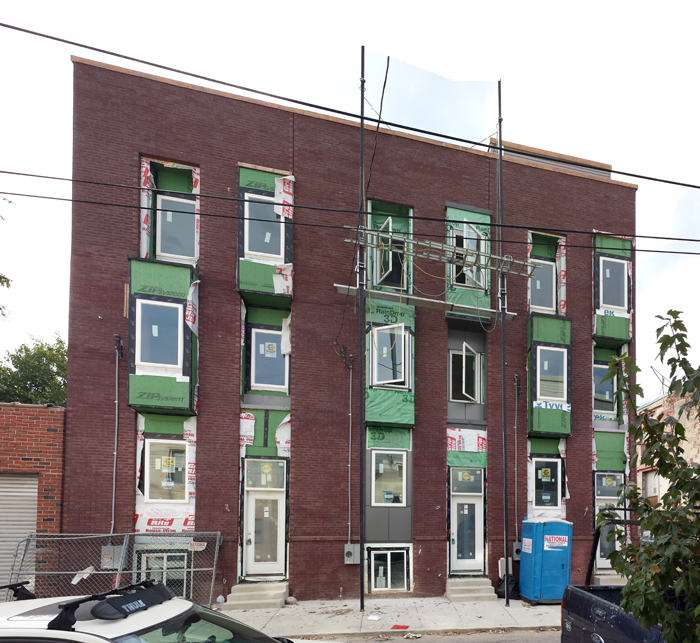 In renovation news, we are making progress on a nine-unit apartment building in East Germantown. This building has been underloved for some time, and its new owner really wants to make it an asset to the neighborhood. We'll be doing a full interior renovation, as well as sprucing up the exterior with new roof, windows, and a covered porch. Existing conditions on High Street near the former Germantown High SchoolHere's a quick sketch of what we're proposing for the front. The downspout will be moved, and the metal-encased brackets around the eaves will be restored to their original condition, or removed. The large front porch will be taken over with planters on the sides and a roof in the center to provide residents with protection from the weather. And as always, there's lots going on in the new-construction world. We visited Arizona Street in East Kensington to take a look at progress. We have one three-building development there which is almost complete (and all three units have sold already!). You've seen photos of that one before, but I'm happy to report that the metal panel on the front is finally complete. 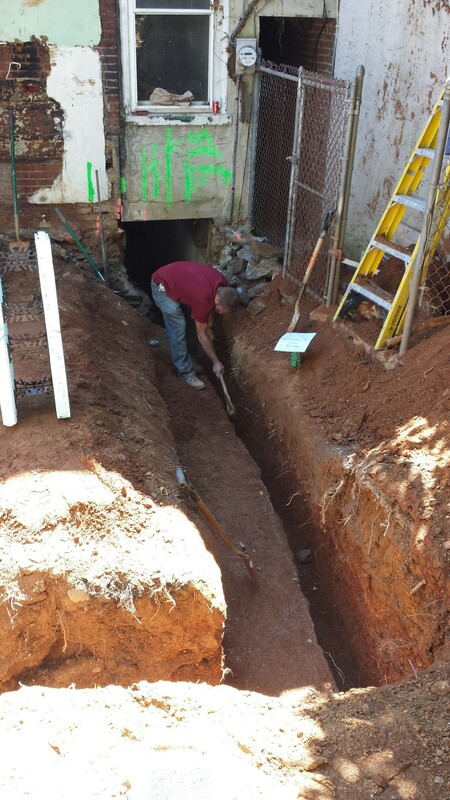 We also saw our project on Coral Street (right around the corner from the Arizona Street project) get started. After a very brief period as a hole in the ground and then some concrete foundation walls, the framing is barreling ahead. From 1) vacant lot to 2) hole in the ground to 3) foundations to 4) framing, in three weeksAnd here's a comparison of where we are today, next to the final drawing. We're doing a more traditional front than we usually do, with a nice cornice and arch-topped windows. On the side where there won't be windows, we're doing a herringbone panel that pays homage to the numerous "ghost windows" often found on factories in the neighborhood. Today, and the future.And last but not least, we broke ground on a new residence on Tilton Street in Olde Richmond. This will be 2,700 square feet--a fairly large (for us) house--since the lot is nearly 22 feet wide. (Normally we work on lots between 14' and 17'.) It's not much to look at yet, but we'll keep updating you on its progress. The black stuff you can see on the outside of the concrete walls is a waterproofing layerCheck back here for more updates, coming soon! If the review hadn't been so interesting, I would have probably spent more time trying to come up with a backstory for these things. But fortunately, the students kept my attention. Congratulations to the students and their professor, Adam Snow Frampton of Only If, on all the progress. Here, sprinklers are going in. Insulation just went in this week, too. 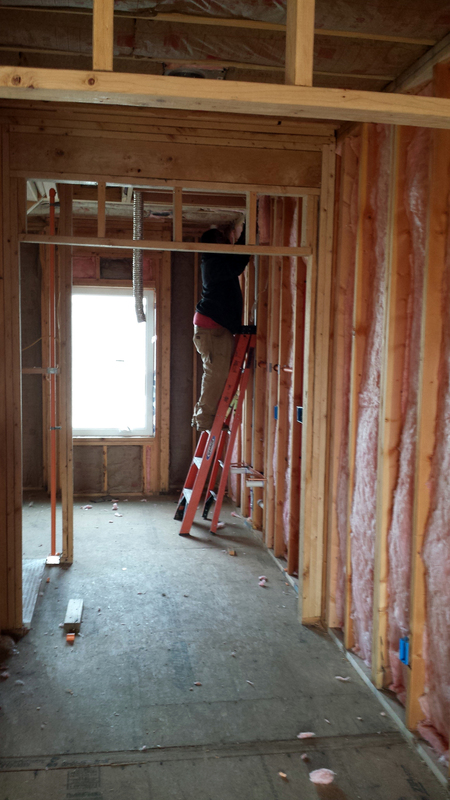 Next door, drywall is up and you can really start to get a feel for what the completed spaces will be like. Here, you can see the sunlight coming in through the double-height glass in the dining room and washing across the kitchen wall. In the finished basement, the electricians are working hard to finalize all of the circuiting for lighting and outlets. 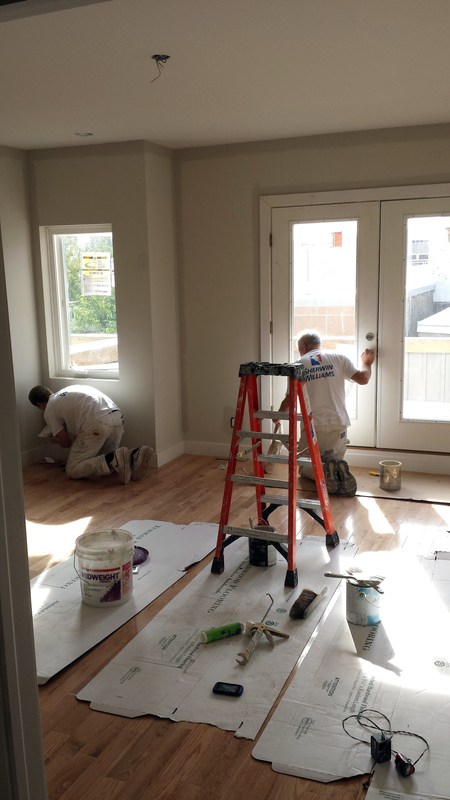 On the second floor, the hardwood flooring is in and the painters are working away. 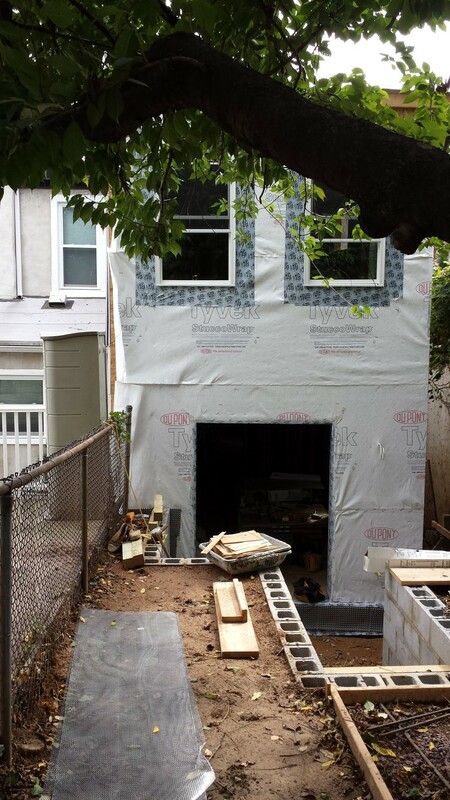 This one is a total gut-rehab of an existing three-story rowhouse. It's right next door to our soon-to-start-construction Parish House project (more on that in a few weeks). Here, you can see that insulating foam has been applied to the exterior of the old brick walls, and will soon be ready for an application of stucco. The system provides good air sealing and a little extra insulation to the overall wall assembly. This project is getting fairly close to completion. 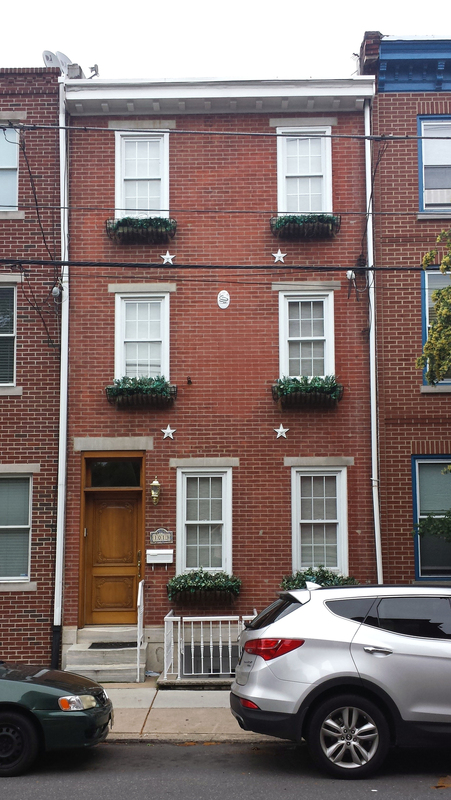 This is three single-family homes, located in the Kensington section of Philadelphia. The neighborhood is an exciting one, and is seeing a lot of redevelopment now. The grain of the neighborhood is varied, with lots of different lot sizes and uses. This gives the neighborhood a "homogeneous heterogeneousness", meaning that difference is the norm. Unlike some other neighborhoods, this one has lots of different sizes, styles, and materials, and is a great place for a little experimentation. 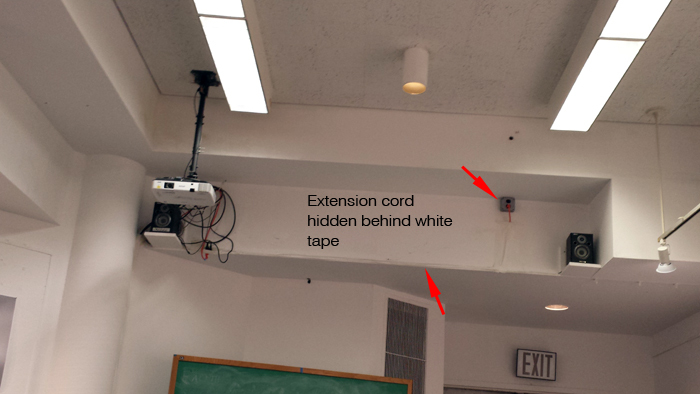 In our case, we have a red-brick wall providing the background for projecting bays and recessed indents running in vertical ribbons on the facades. The bay cladding is just going up now; it will be a dark gray metal panel. You can see the front is currently in various stages of completion (close-up below). Inside, it's much the same; in the house on the right, drywall has gone in and other finish work is just beginning, while in the house on the left, the utilities are still being installed. Here's another project that's almost complete. 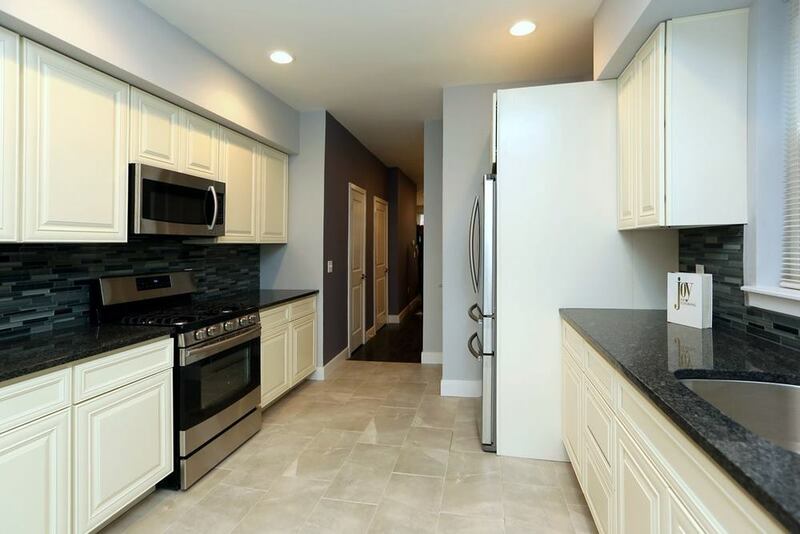 Located just north of Girard Avenue in the South Kensington section of Philadelphia, this project is three new three-unit condominium buildings next to a two-unit renovation. By removing and rebuilding the existing (nearly collapsed) facade of the old building (the gray one at the far left of the group), we were able to design a rebuild that ties in visually with the other, new facades. These units are now on the market. You can see more info, including professional photos, here. The top-floor unit of building 1321 has been staged for the photos, so you can really get a feel for what the units will be like. 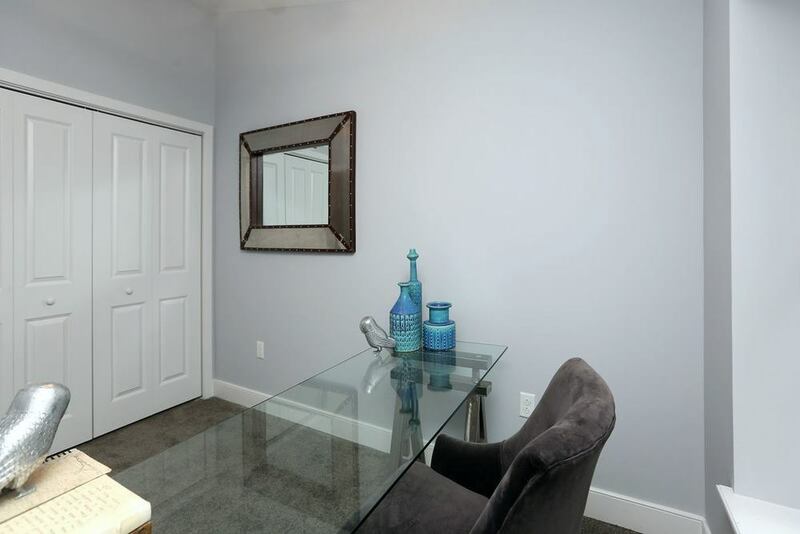 The top-floor units are my favorite, because we were able to get very large (4' x 8') skylights over the kitchens, and the units also have access to roof decks with great views of the skyline and Ben Franklin Bridge. We've got all sorts of other things going on. Of course, there are other projects under construction that aren't featured here. And with winter quickly approaching, the rush is on to get building permits and start excavation and concrete work before the ground freezes. Currently, we have several projects in various stages of permit review with the goal of starting before Thanksgiving. On the horizon we have a few new-construction projects to get design started on, as well as the full renovation of a beautiful old apartment building in Germantown, a restaurant in Point Breeze, and an adaptive reuse of a former varnish factory in Holmesburg. Keep your eyes here for more updates! 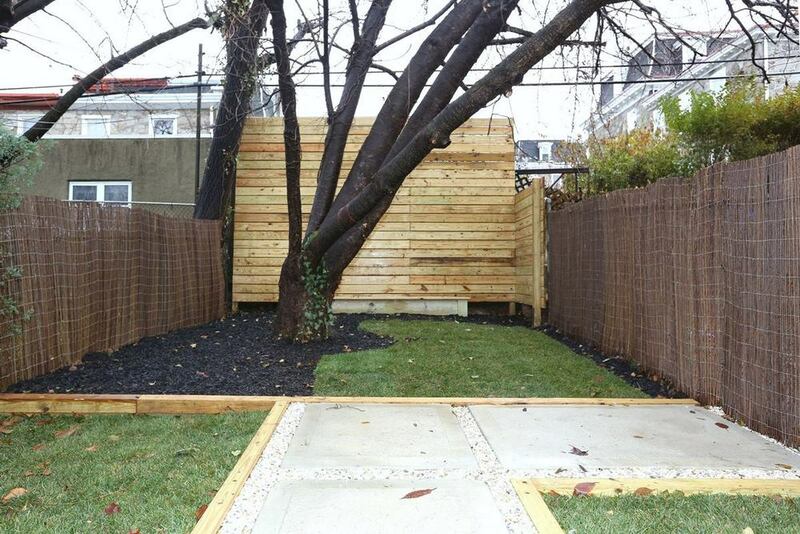 This is the latest project we've completed, at 3253 Sunnyside Avenue in the East Falls section of Philadelphia. Back in July and August, I wrote two posts about the beginning of the design process. At that point, I had just finished the two initial phases: existing conditions documentation and design. Between the drawings in the first two posts and now, there was, of course, the process of construction. Below is a slideshow depicting each stage of that process. Master Bedroom, before and after. We removed the large chimney and raised the ceiling to make the room more spacious. The Kitchen was probably the most dramatic change. 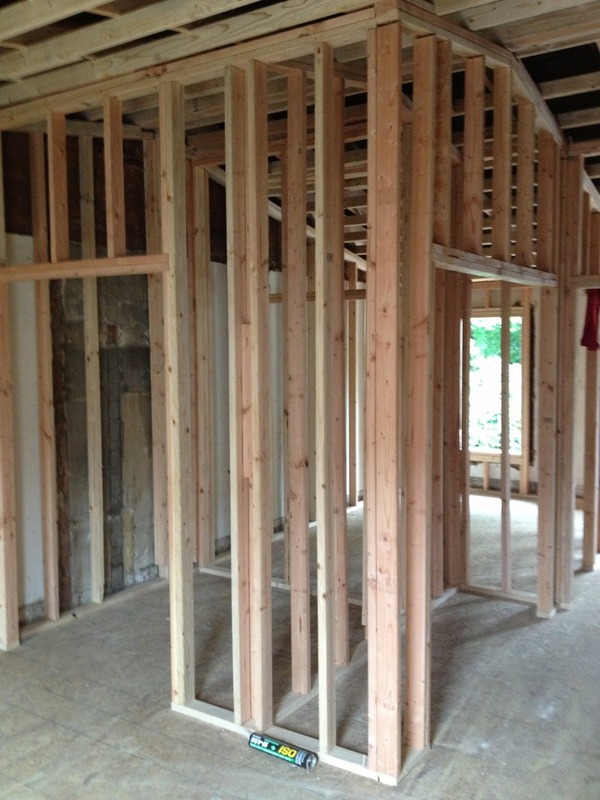 Here, a view of the existing room, the new room just after framing, and the completed space. This was a very successful project with a great client. The construction quality is very high and everyone really took pride in it. Special thanks to the realtor and client for many of these photos. The house is currently for sale. You can see the listing here.